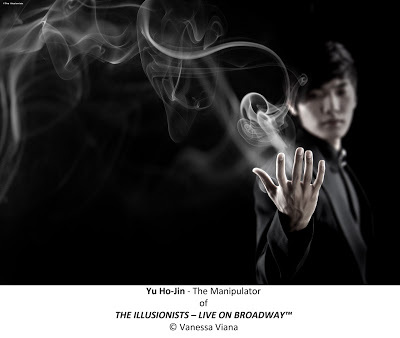 The Illusionists: Witness the Impossible sold out last year in a limited run on Broadway and returns again this year for another highly anticipated run during the holiday season. Connecticut residents don’t have to wait to see the work of seven of the world’s most acclaimed illusionists, however, as the show’s tour makes a stop at the Bushnell this week. The real question for me is, "Do I really want to?" This show, conceived by Simon Painter (with creative direction by Jim Millan and direction and choreography by Neil Dorward), is not your grandmother’s version of a magic show. Oh, yes, there are some of the elements you would expect like pulling a rabbit out of a hat, card tricks, sawing a person in half, escaping from a straitjacket, etc. All of this is done with colorful flashing lights (design by Paul Miller) and video projections (designed by Darrel Maloney). There also are some unexpected bits, like a very, very creepy guy forcing a coin into his eye and cutting it out of his arm, and another lying on a sharp nail and placing a scorpion in his mouth while handcuffed and placed in further peril. These acts seem more fitting for TV’s “The Fear Factor” than a magic show. There also is a crossbow demonstration that is interesting, but not what I would call an illusion. When it comes to “Fear Factor” and shows of that genre, there is always something else on I would prefer to watch, even if it is something as horrible and frightening as “The Brady Bunch.” I never have been able to figure out why people would want to watch others do potentially harmful or stupid things. I have to admit it, but I never have been wowed by Houdini’s water torture trick, so seeing it performed without curtains hiding it here didn’t do anything for me either. · The Anti-Conjuror, Dan Sperry. Described as Marilyn Manson meets David Copperfield, Sperry combines the art of magic with the macabre and is one of the top-10 most Googled people, thanks to a legendary “America’s Got Talent” appearance. · The Trickster, Jeff Hobson is the epitome of glamour and showmanship. Don’t be fooled by his innocent appearance; Hobson has audiences laughing long after the curtain goes down. · The Escapologist, Andrew Basso. Italy’s star escape artist, Basso considers Houdini his hero and is fast becoming one of the world’s most popular illusionists. He is the only person in the world to perform Houdini’s famous Water Torture Cell with absolutely no covers. · The Inventor, Kevin James, known for innovative illusions, is an inventor, comedian and collector of the strange and unusual. He is one of the most prolific inventors of magic in the world and has created some of the most celebrated illusions of the last century. · The Weapon Master, Ben Blaque, has established himself as America’s foremost master of the crossbow after appearing four times on “America’s Got Talent.” He performs incredibly dangerous acts of dexterity using highly powerful crossbows to shoot various objects supported by his assistant. · The Daredevil, Jonathan Goodwin, the British-born Goodwin is considered to be one of the most creative, skilled and craziest stunt performers in the world who has been hanged, buried alive, hung by his toes from helicopters, burned at the stake and attacked by sharks. The Trickster. Hands down, the best part of the show. Hobson is delightfully snarky, causing belly laughs among magical tricks. He’s a cross between Liberace and Don Rickles and I would have enjoyed the show a lot more if it had been two hours of just this guy insulting audience members and killing balloon animals he made for little kids in the audience. The Manipulator. Yu does some amazing card tricks. Cards change in front of your eyes and appear from nowhere. Audience participation. A number of people are selected and brought up on stage to verify that props are real and not tricks or to participate in actual illusions. Their interaction with the illusionists and reactions are quite entertaining (one woman’s reluctance to check out a severed torso was a hoot). If you want to catch The Illusionists here, it is at the Bushnell, 166 Capitol Ave., Hartford, through Sunday. Performances are Wednesday and Thursday at 7:30 pm; Friday at 8 pm; Saturday at 2 and 8 pm; Sunday at 1 and 6:30 pm. Tickets $29.50-$89.50 (860) 987-5900; www.bushnell.org. If you’re too busy watching “Fear Factor” or planning a macabre Halloween party and want to catch this later, the show will play at Broadway’s Neil Simon Theatre, 250 West 52nd St., NYC from Nov. 19-Jan. 3. www.theillusionistslive.com/broadway.